Yesterday ended up getting away from me, and I could not get to the brew shop to pick up the barleywine ingredients I needed to brew today. Or to BJ's to fill the gas cylinder. Or to the supermarket to get the water. Sigh...hey, sometimes there are more important things than brewing. I know, I know hard to believe but true. So I got that all together today with the intention of having an evening brew session but once everything was said and done I didn't feel the desire. It would have all been too rushed. So I'm brewing tomorrow. It should go quickly as I'm only making 3 gallons and it's an extract w/ steeped grain recipe. Plus my yeast starter can use the time to kick into higher gear. Color: Close to a Sierra Nevada Anniversary Ale. My to-be-carbonated "new beer" is on the left, the Sierra Nevada (which I just happened to be drinking last night) is on the right. Aroma: Pleasant but not overbearing cascade aroma - floral, citrusy, just a bit spicy. Taste: There is an assertive (but not overly so) bitterness that gives way to a mild grapefruit taste at the finish. Your taste buds are left vibrating slightly from it, but it is by no means harsh or unpleasant. I made this recipe from a similar one I tried some years back. That beer turned out way out of balance, and drinking it was akin to having your tongue flattened out by a bitter, grapefruit flavored Louisville Slugger. I was worried that this may come out the same, but it most certainly did not. I'll get a more thorough taste report when it's finally carbonated. Overall: I love this beer. I was "eh" over the Porter, (though I've had my local homebrew shop owner confirm it was just fine), but this has (thus far) turned out better than I thought it would...by far. Assuming it doesn't go to hell in the bottle, this one is a keeper - something to use as a standard as time goes on and watch it improve as I do. As a note, I had a small disaster dry-hopping. The bag ruptured putting half the hops (and marbles for weighting the bag) outside the fermenter. So I didn't get as much in the fermenter as I wanted to. Turns out, it may have just been enough. We'll see. 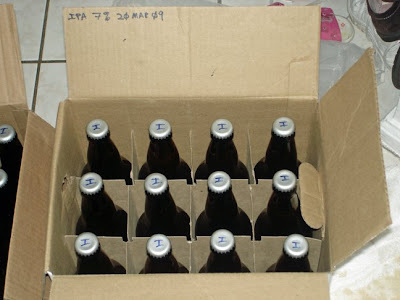 I also had a lucky break when I set my racking cane down on the ruptured bag to rack the beer to the bottling bucket, as the torn bag acted as an additional filter preventing sediment from transferring. Since I also used gelatin as a clarifier I'm wary that there might not be a lot of yeast sediment that transferred and the beer will carbonate slowly, but I don't think that will be much of an issue. It's a nylon straining bag and not a micron filter, and I plan on letting this stuff sit several weeks before trying. 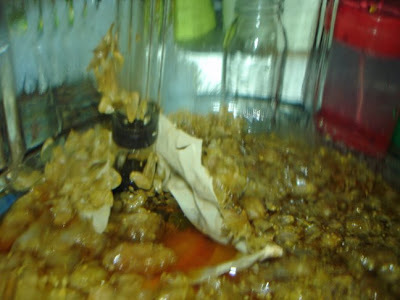 I also need to think through a better mechanism for dry-hopping than filling a straining bag with whole hops and sanitized marbles and trying to force it into the carboy. There they are...well, half of them. 12 x 22oz bottles. I also have one case of 12 oz bottles and one 16 oz swing top. Not a bad haul. I marked an "I" on the caps so they are not confused with their friends the porter bottles.